The latest statistics reveal that the numbers of LinkedIn users have become 546 million. It’s really a wow figure and clearly indicates the worth and importance of LinkedIn as a reliable source to establish the link between the recruitment companies and job looking candidates. Well, the alarming thing is that, how to make it easy for the recruiters to find our LinkedIn profile within no time during their search for a particular candidate and how to make our LinkedIn profile so striking and powerful that it would compel the recruiters to stay at it and feel pleasure to place our profile on the shortlisted list? 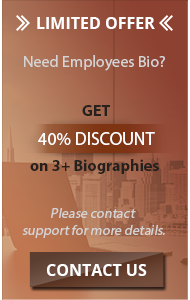 Several biography writing services are available online that not only offer the best services in writing the LinkedIn biographies for different professions such as army biography, chef biography etc but also make a good LinkedIn profile in affordable rates. It all depends upon the level of expertise in writing a LinkedIn bio. Yes, it is the fact that a good LinkedIn profile itself does a job of recommending you in front of recruitment companies due to its charming style and professional layout. Always remember! Writing a great LinkedIn profile means you have to put all those ingredients in your profile which are considered mandatory elements of selection criteria in the eyes of recruiters. That’s why people realize the importance of professional writers who have vast experience of making good LinkedIn profiles with much higher success rate. However, the important thing is that you must be aware of those key points without which you cannot claim a LinkedIn profile, a good profile. If you’re looking for a chef biography – we’ve got it. Let’s have a look at some current but interesting facts and Statistics about LinkedIn. Among 546 million total LinkedIn users, 146 million only belong to the United States. LinkedIn profiles having photos of users get 21% more response in terms of profile viewing and 36 times more response in terms of receiving messages. Despite free service of LinkedIn, nearly 40% LinkedIn users pay some amount to use the special features of LinkedIn. LinkedIn is being used in 200 countries worldwide and China is also one of them even it forbids both Twitter and Facebook. 56 % LinkedIn users are male, while 44% are female. 13% LinkedIn users have no Facebook account, while 59% LinkedIn users don’t use Twitter. 41% LinkedIn users connect the service via mobile. 35% LinkedIn users open their account daily, while 42% users update their profile regularly. you worried about the format of your LinkedIn profile and want to know how to write a good LinkedIn bio? Just read these easy steps to write LinkedIn profile in best and professional format. Following are the steps to write a great LinkedIn profile. Before writing a LinkedIn bio, you must be very clear about your goal behind making your LinkedIn profile as well as the target readers. If you are the job seeker, you must prepare your profile by keeping the psychology of recruiters in your mind. However, if you are an employer, the job seekers should find you easily by putting a single glance at your LinkedIn profile. 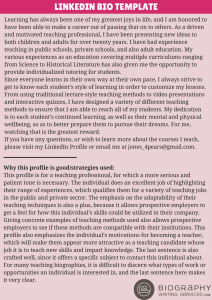 Following questions will help you in writing your profile in such a professional manner. Q 1: Who is your reader? For the job seekers, the reader is not only Recruitment Company. You must keep in mind that the member of your contact list will also read your profile and these could be a better source to recommend you for the job that is relevant to your skills and experience. However, in the LinkedIn profiles of company owners or recruitment persons, only those readers are interested that are looking for some jobs. Therefore, there should be a clear difference between these two types of LinkedIn profile due to having the different psychology of readers. Q 2: How to give different look to LinkedIn profiles of Job Seekers and Recruiters? There are two things that readers see in the LinkedIn profile firstly and decide, this is the profile of job seeker or Recruitment Company. The profile photo and headline. This is the dress code that differentiates a candidate from a recruiter. The candidate photo must be in the formal dress with a straight face, but profile photo of company owners or recruitment staff is usually easily distinguished due to their casual face direction but again in formal dress. Moreover, the headline of job seeker should depict the skills and expertise in contract to the headline of recruiters that show the nature of business as well as products and services. Q 3: What do you want readers to know about you? What do you want readers to know about you doesn’t matter so much. The important thing is inverse i.e., what your reader wants to see in your profile? Let’s see the answer to this question. Q 4: What your reader wants to see in your profile? Remember! The reader has no time to read the irrelevant profiles, that’s why; reader put the first look only on the name, photo, and headline of profile holder while searching the profiles in accordance to relevant keywords. In short, your headline must be relevant and strong enough to catch the reader. Q 5: What you want to achieve through your LinkedIn profile? You must be damn sure about your aim of making LinkedIn profile. 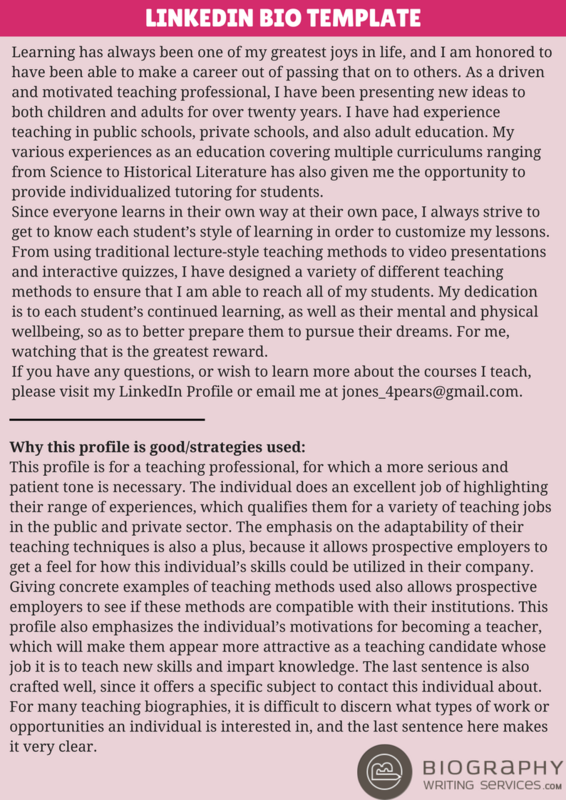 You should design your profile with candidate’s point of view if you are the job seeker and must mention your education, skills, and experience in the header of your profile. However, for designing the profile of recruitment agency or company owner, the header must mention the position of profile holder in the company as well as the nature of the business. The headline of your LinkedIn profile must give a look of a strategic piece of content in your profile. This is a most important thing in any LinkedIn profile because people only read relevant profiles and the check the relevancy through headline of the profile. Well, how your profile will be shortlisted in search results of any person? These are the keywords that drag any profile within the search results. You must mention your skills and expertise in all famous keywords that are relevant to your field or nature of work. You can find these keywords in Google Ad Words. The URL of your LinkedIn profile is much important to show you in front of search results easily while they are searching for you or some person having relevant skills that you have. You should customize the URL link to your LinkedIn profile such that, it will be short and have such keyword that people could find you easily. There is a common saying that a good photo has a worth of at least 1000 words. It means what you want to say about yourself, your photo will explain all these. Yes, your photo reveals your personality, face value and your choice for selection of photo for LinkedIn profile. So, choose your best photo for your LinkedIn profile as don’t take the selection matter of header image lighter. It’s better to select such image for your header that it will reveal your key achievement in your field. 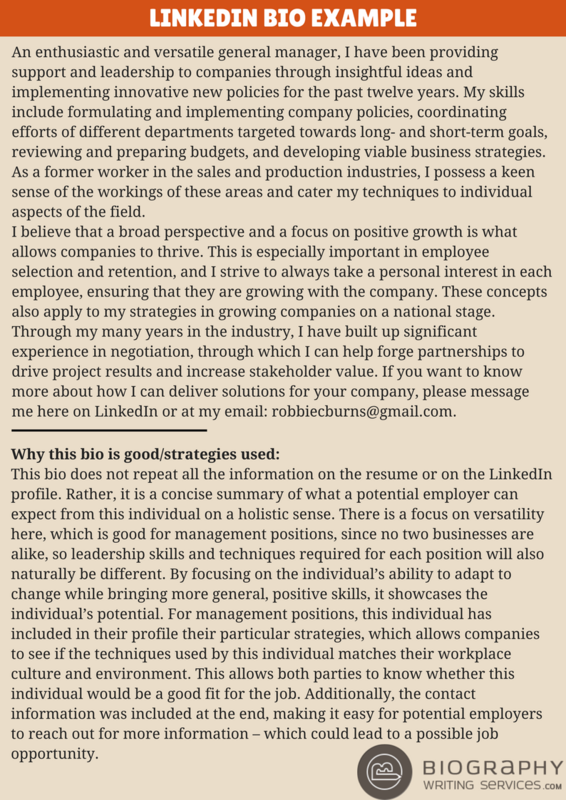 If you want to write a summary for LinkedIn, then you have to be very careful in using the space for your summary. When anybody gets impressed by your header and start reading your profile, then the summary is the only source where he can discover you in details. But don’t make it boring and lengthy by adding unnecessary and less important things. Use the bullets to explain each part of your professional career separately and make each part impressive by adding videos, documents, images, and presentations. Some people don’t like to show the contact list openly in their profile. Well, this is not the professional way. You should make a spate box for your contact list and add this box to your LinkedIn profile very beautifully so that readers could make an opinion about you with the help of your friend circle. This is the part of your LinkedIn profile where you can discuss your professional life in a detailed manner. Here, you should use bullets to highlight your work experience, achievements, and skills. However, always keep those experiences and achievements at top of the list that matches your education and expertise. In this part, you can include the recommendations of some important and famous personalities about your skills and eligibilities. This thing always imparts a great percentage in the selection of a candidate. At the desktop screen, 220 characters of your LinkedIn profile come in front of the readers at a single glance; however, at the mobile screen, only 92 characters are visible to readers. So, optimize the appearance of your LinkedIn profile in such a way that it will be most impressive for 92 characters and as exciting for 220 characters to grasp the attention of both types of readers. Q 1: Does the opening sentence, phrase or heading make you want to read more? Q 2: Does your profile photo compel the reader to stay at your profile? Q 3: Did you summarize your story in the summary? Q 4: Did you showcase your expertise and Experience? Q 5: Did your LinkedIn profile speak for you? Ask your friend to read your profile. If the answer to all your questions is “YES”, then you have no need to revise any part of your LinkedIn profile. However, in case of any “No”, you must edit that part of your profile to make the answer “Yes”. The most important difference between a resume and LinkedIn profile is the ease of being shortlisted for a particular job. With the help of LinkedIn profile, the keywords those are included in the headline and URL link of LinkedIn profile that make the search of candidate very easy, raise the chances of shortlisting much more. You can say the resume is only one part of LinkedIn profile. In resume, you cannot show all your details at a single time in contract to LinkedIn profile in which you can show all the key aspects of your professional life on a single screen. A resume is basically Linked In profile summary. However, the other parts of LinkedIn profile cannot be designed so beautifully on a resume that is allowed in LinkedIn portal. 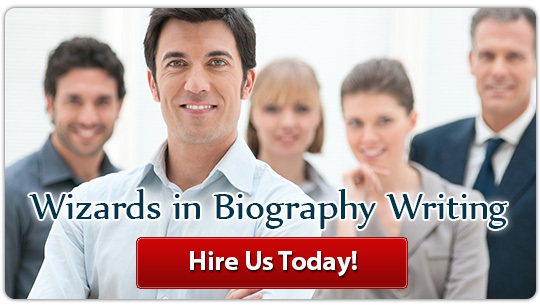 Check our professional army biography and get what you need. Secret search for LinkedIn profile is that in which people browse the LinkedIn in “Private Mode”. In “Private Mode” the name and other information of the person who is browsing the LinkedIn is not shared with owners of LinkedIn accounts. This secret search mode is used by the business owners, recruiters or other bossiness professionals who search the candidate for any vacancy or check the sale leads of business competitors. To view the secret search, you have to buy the premium account of LinkedIn because it is not possible to view the browsing person with Basic or free LinkedIn account. In contrast to secret search, a non-secret search of LinkedIn account is that in which browsing person is also using the ordinary mode of LinkedIn under the basic or free LinkedIn account. We offer professional LinkedIn profile writers having vast experience of writing good LinkedIn profiles. We offer 24/7 online customer help service with an availability of our professional writers. We offer direct contact with our writers so that you could guide them about your precise requirements. We offer fully customized design, format and color scheme of your LinkedIn profile as per your own choice. We offer a combination of best service and best price with amazing discount offers. Either writing a LinkedIn bio or LinkedIn profile, it is better to hire the services of some professional writing service to get the key objectives of using LinkedIn services.